Hardbound, 306 page. Complete guide to kerosene Aladdin Lamps. Fully illustrated with diagrams of burners and lamps. A classic reference for those interested in Aladdin lamps. $39.95 plus shipping. In US priority mail $11.35. Softbound. Identification and history of center-draft kerosene lamps. Fully illustrated with diagrams of burners and lamps. An extensive reference. $55.00 plus shipping. In US priority mail $11.35, international higher. Three books offered in a set, Angle Lamps Collectors Manual, The Light that Never Fails, and More Light on Angle Lamps by Bill Courter, features the various burners used over the range of years the lamps were made, and other detailed information about these fascinating lamps all together in one set. Helpful to both beginning and advanced collectors. Updated in 2004 and fully illustrated. This is a valuable reference written as a labor of love by the late Dr. Lahde to share his extensive knowledge and experience in the development of kerosene lamps, lanterns, heaters and stoves. He explains the principles of hydrocarbon burners that have provided light and heat for millions of people around the world; and, he challenges engineers to continue improvement of hydrocarbon burning appliances. Dr. Lahde was born and educated in Germany. He held a Ph.D. from the Technical University of Berlin. He worked for Ehrich & Graetz from 1926 to 1945 prior to coming to America. He and Fritz Graetz hold two US patents. Dr. Lahde worked for Aladdin Industries, Inc from 1947 to 1960 and for American Thermos from 1960 to 1966. He retired and wrote this book, never published in his lifetime. The book has 206 pages in 20 chapters covering the basics of fuels and combustion, wicks, wick burners and mantles, lanterns, stoves, and gasolene appliances. It is a technical reference. The book is a copy of a hand-typed manuscript. 7 introductory pages about Dr. Lahde and a 7 page appendix have been added. The appendix is a translation (courtesy of Ursula and Heinz Baumann) of a 1941 Ehrich & Graetz booklet with photos of Albert, Adolf and Max Graetz. There are more than 288 detailed line drawings to illustrate Lahde's writing. The 1883 -1884 Bradley and Hubbard Kerosene Fixtures Catalog is one of the finest lamp catalogs in existence, perhaps second only to the 1860 Deitz catalog. This catalog captures Bradley and Hubbard at their peak in terms of quality and diversity of offerings. Every kerosene lamp collector and researcher, as well as those involved with historical properties, and students of domestic design, will want one of these reprints. Publication date is mid-July, 2001. This reprint is available from the owner of the original. Please go to B&H REPRINT for more details, access to sample pages, and ordering information. Published in June 2003 and includes five catalogs never before reprinted. A must-have reference for those interested in lamps of the 1868 to 1883 period. These catalogs illustrate about 420 lamps and parts. About one-third are in color and there is a wonderful full-color cover. For the first time you will be able to see the links between companies like Bradley and Hubbard, Tucker, J.C. Ives and Union Glass. Also included is information on the companies, the catalogs, additional ephemera, patent information, a price guide, and a cross reference showing lamps which occur in multiple catalogs, including the 1883 Bradley and Hubbard catalog published as Volume 1 of the Historical Lighting Reprints. Two Tucker Manufacturing Company catalogs of wonderful, early hanging, bracket and stand lamps, including many spectacularly illustrated in color!. The c1868 catalog contains 58 color pages, and the c1875 catalog contains 40 pages. Tucker was later acquired by Bradley and Hubbard. A c. 1875 Union Glass Company catalog of 40 pages. The reprint is printed on high quality, coated stock. The size is 8.5 by 11 inches, perfect bound, with a full color soft cover. Every kerosene lamp collector and researcher, as well as those involved with historical properties and students of domestic design, will want one of these reprints. This valuable reference is available only from the publisher and select antique dealers - not available through any bookstores. The number of copies is limited. Hundreds of lamp enthusiasts have already ordered their copies - Order Your Copy Now. Please go to Volume 2 - Historical Lighting Reprints for more details, access to sample pages, and ordering information. an Adams & Co. catalog in color - showing rare lamps such as the Temple and Vase. Lots of round-wick lamps - hanging, banquet, figural, and piano. Just about every type of lamp in use in America at the time. Even four or five pages of lanterns. Volume 3 is big - 248 pages, price guide, covers the 1885 to 1895 period. Same good quality as the previous volumes. Regular price is $40. Mention that you saw this on the Lamp Guild website and get a discount! Many sample pages and more information at Volume 3 - Historical Lighting Reprints . This is a brand-new book on gas street lighting. It is full of interesting illustrations: old engravings and paintings, old and recent photographs, catalogue pictures and advertisements. The text is all in German, but if you can't read it, you'll enjoy the images. There are many gas streetlights to see, old and current ones, mainly from continental Europe. 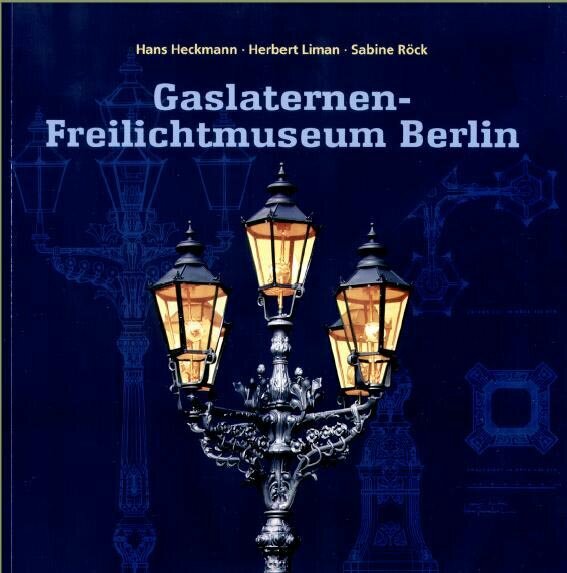 The workshop "Light" in the German Museum of Technology in Berlin (GMTB) has just published the museum's guide named "The Open Air Gas-lantern Museum Berlin. The reader will find detailed information on all 90 lanterns on display, a numbered map, the history of the gas-lantern museum and Berlin's gas street lighting, as well as up-to-date statistics on gas-lighting in Germany and some other countries. 96 pages, price 19.90 Euro + shipment. The Australian Lamplighters Guild, Inc. is offering for sale a reference book on Oil Lamps and Chimney Trademarks of Great Britain, as held in the State Library of Victoria, Australia. This book is A4 in size, soft cover comprised of 122 pages. Printed in Australia. Along with the Trademark Illustration's it lists the manufacturer's details, as well as date of manufacture where known. This reference book comes complete with a separate A4 size index of Illustration Number, with the page number, and listing the manufacturers details. The author, Pete Davenport, is a foundation and long standing memer of the Guild, and has spent a considerable amount of time researching this Trademark reference publication. The Australian Lamplighters Guild Inc. Cost is AUD $40 Posted to the USA. Payment may be made by direct deposit, bank draft, or money order payable in Australian Dollars. Westpac Bank, Blackburn Vic 3130, BSB 033-112, Account No. 23-5315, Swift code WPACAU2S. Buyers will be notified of receipt of payment if an email address is supplied, and goods will be shipped within 3 working days. Direct deposit buyers please advise of payment with some ID to facilitate your order promptly. 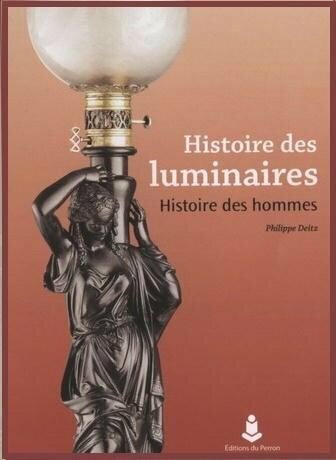 This is the first book on the Global History of lighting issued in French for over a century. It begins with early lamps from pre-historic times and brings the development up to the 20th century. Philippe Deitz, Belgian collector and owner of the Liege Museum for ancient lighting (mainly 19th century oil and gas-lamps) put together texts and images from different collections: his own, or other Belgian and European contributors or collectors. All in French language but also interesting as an album of fine images, this encyclopaedia of over 600 pages with ca. 900 illustrations can be ordered from an on-line bookstore or from the editor. The retail price is 56 euros (+ payment costs) and shipment.